25 adults aged 50-69, with type 2 diabetes, were randomised to follow a Paleo diet or the American Diabetes Association diet. Three meals and three snacks were provided. An attempt to avoid weight loss was made by calculating maintenance energy needs and then adjusting calorie intake if 3lb (~1.35kg) of weight loss occurred. The ADA diet is not defined in the paper except for “…containing moderate salt intake, low-fat dairy, whole grains and legumes”, as opposed to the exclusion of these foods in the Paleo diet (excluding added salt, not all salt). There is also no measurement of what the participants ate, except for macronutrients and some micronutrients. Calorie intake was identical and macronutrient ratios were fairly similar although the Paleo group had slightly lower protein, fat and SFA; and slightly higher carbohydrate and MUFA. Blood lipids: both groups had decreases in HDL-C, probably due to lower fat intake. The Paleo group, but not the ADA group, had significant decreases in total-C and LDL-C probably due to both the very low SFA intake and high fibre intake. Triglycerides almost significantly decreased in the Paleo group, but not the ADA group, despite higher carbohydrate intake and no difference in weight loss and baseline triglycerides, which may be due to high fibre intake. 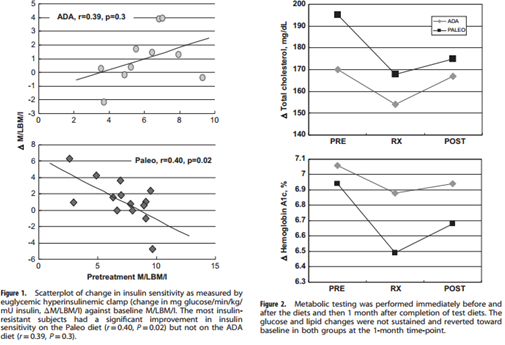 Lastly, after the trial was over the participants seemed to revert back to their old diets (based on urine sodium and potassium) and consequently the reductions in cholesterol and HbA1c were also reverting back to the usual level. The % for protein, fat and carbohydrates total 103.5%? How is that possible?